Great post Patsy. Amazing how seeing faces in the photos you relate to them. I recognize your Dads face and Pat Neary with the really blonde hair. The Nearys lived next door to my uncle Albert (Turner) who built a fence across making a yard between the 2 wash houses in Garden street. I recognize the man in the center of the photo holding the almost empty pint and the guy on his right with the walking stick. Thinking they might be brothers. Will be interesting when others start naming some of the men. Certainly looks like an important occasion as they are mostly suited up. Obviously this has to be before the Nearys left Broompark. And a big memory blast for me seeing that first holy communion photo. I remember your brother now and also Dennis Campbell. Did Campbells had the shop on front street ?. The class photo being 1964 ` we were already in Australia but some of the names still ring a bell. I was only 14 in 1964 and i am thinking you might have a couple of years on me.? Great post Patsy, Thanks, and hope others might find more Broompark photos. Maybe you could ask around those you still see. I am sure there will be plenty out there but a lot of us now being in our sixties – some dont even have a computer to know or access these memory sites. Am i getting mixed up here because i remember Mr Neary as being quite tall and very blonde hair. The guy drinking looks quite young so i was looking at the guy on his left with the glasses holding a cigarette.? But if the Nearys left Broompark in around 1956 i was only 6. Getting moments today where i cant remember what i did last week, let alone 60 years ago LOL. hello. I seem to remember my childhood better than I recall last week. I am pretty sure I have Pat Neary right but we shall have to let young Pat confirm it if he sees the photo. The faces in the Loves photo are all familiar but they were people mum and dad knew in the village so we would hear names but maybe be unclear as to who it was. My favourite man in Broompark was Billy Welsh from the farm, dad of Trevor, Alan and Eric. He was the best bloke ever and I loved it when he came to our house for the milk money. He stayed in touch with my folks and I saw him last when he visited them in Esh Winning. There was always loads of kids running around the farm and he wouldn’t tell them to clear off in case they ran into the road. He told a good story too. I also hope others will fill in the gaps for us. If you are the same age as my brother then yes you are 2 years younger than me. Dennis and Jim Campbell did live above the Walter Wilson shop their dad ran. I can recall your family and the Turner’s leaving the village, it was a big thing to do. We already had family in Australia, Dads sister was there teaching in a convent and Mum’s sister and her family were there also, all in Perth. I saw one of my cousins last year when he visited, he’s on the Gold Coast now – looks lovely. Sheila Hudspith remembers her mum buying furniture from the Turners when they emigrated, it was very glamorous for the time she recalls, built in lemon squeezer! I never felt the need to move far away – stick to what’s familiar eh? I have been mentioning the site to others but not everyone is as keen as us on looking back to those days. Broompark is a special place to me and I always drive that way when I go to mum and dad’s grave. are you the Frank Clarke who used to spend a lot of time with the lads in Broompark, but lived nearer Durham/Nevilles Cross? If you are I remember you. You’ll remember the Welsh family too. Well fancy that. Yes I too remember the Loves doorway where you all used to gather. I also must admit to loving all this reminiscing because it does make you feel young again. Thank you yes, I am well and happy, retired and spending my time simply doing the things I like to do in and around Durham. I’m not sure where you are living but hopefully you are well and enjoying life too. this is great hearing from everyone. I remember Sheila, then Clark, They lived in James Street like us until they moved to Front Street and us to East Street. I think John her brother still lives locally. 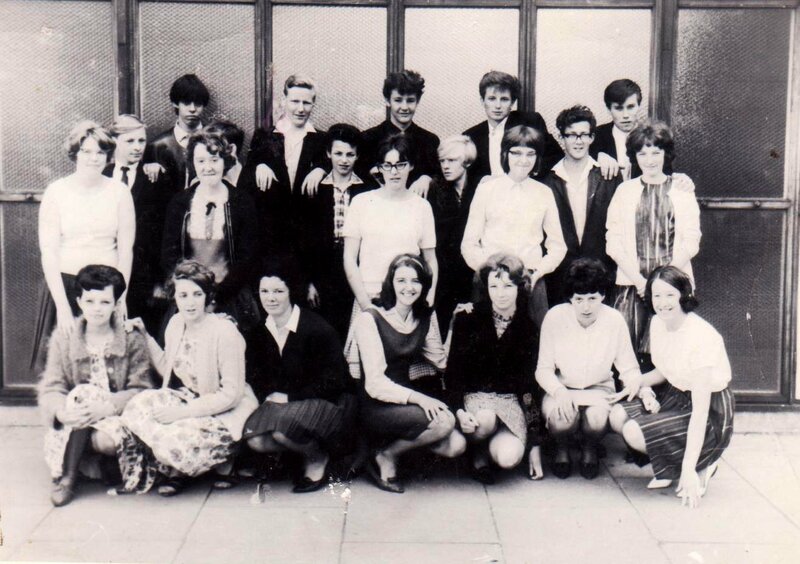 The only person I think I know in the photo from the hut is (maybe ) Margaret Richards, near the centre. I also think I recognise Joan Cheesey but I will ask Sheila Hudspith and Jean Clark who they know. Sheila will remember the Youth Club too I expect. Am I right in thinking there was two Patterson families, one in the pub and one in James Street. If I am right both had sons called Billy and people used to call them ‘big’ Billy Pat and ‘little’ Billey Pat. not down to size but to age, one older than the other. Have I made that up? Who was Alice Patterson? I think maybe the McGarrs lived next door to the Ditchburns – but maybe not. A little while ago there was a group of us girls who had grown up in Broompark used to meet up. Sheila, Jean and Maisie and Sylvia and originally we used to go to the Loves for a drink. We called ourselves the Broomparkers!! Two blokes ran it and the decor was great with leather sofas, twinkly lights but it changed a bit when they moved on and so we went to the Duke of Wellington. That said we had a meal at the Loves when I was 60. We were in a small room to the right of the front door. I never got past the doorway, or the hatch when I lived there. I saw Eric Welsh one night but no other ‘old’ faces ( ie from our younger days) We girls used to go over ( and over) things and people we remembered from those days. A little while ago I saw Kathleen Kennick and I still send cards to Audrey Hutchinson who lived next door to us in James Street. I occasionally see Joan McGovern. Sometimes you think you know a face in the town and you think Broompark – not necessarily a name. The memory plays tricks unfortunately. When my mum died my brothers girlfriend booked them somewhere fairly near to stay without checking with him. She then drove him to Broompark and pulled into the Farm. He could not believe that he was back where we lived as toddlers. The door opened, Alan said ”Bryan Fehily” and he said ”Alan Welsh”. Alan was very kind and sympathetic given the circumstances. His dad did have the worst of luck in later life with the accidents but its great to know there is still a Welsh living there. I still look at those buildings when I pass, remember how there was postings on the end wall as to what was on the pictures at Ushaw Moor the next week? Yes Frank, I too seem to feel the need to look back. I remember your liking John Leyton but I was a Beatles fan from when they started. A John Lennon girl forever. We still see JL in the Great Escape, and occasionally hear him on the local radio station that only plays old records. Wild Wind was played a while back one morning. Does anyone remember the Kiosk in North Road in Durham? – why did places like that have to disappear — and the Savoy and the Vaudeville next to it. Dare say it was progress but we lost to much when they chopped Durham City up. And it is sad to see the gaps in Ushaw Moor now where people could gather as groups. Broompark too – designated a Category D village, pull most of it down. Mind you I think the Hut went quite early on didn’t it? I have decided that if I think I have seen someone I recognise from Broompark in the town then I shall go up to them and ask – what the worst that can happen? The first hut was being used between the alleyway, but the dance hut was behind front street and at the back of the presbitarian church.? We had dances there on a weekend night. That hut was later removed to Denny fullards scrap yard (only reason i know that is because i have been told by terry fullard.) Unfortunately all these posts are seperate instead of being one post on broompark and i am scratching my head on how to bring them together. Who was the girl who,s father was a minister of a church. ?was it a clark?. I remember joan Mcgovern, Barry mcgra and already had contact with kath kennick. Funny how the more of us meet~~ we seem to get our memories back working. Just looking at photos has brought back memories to me and also reminded me of your brother Brian who i knew at St josephs. I left Broompark as a fairly innocent young lad, (although i could tell a tale lol). My memories are still of a 12 year old. Guess most of you went a lot further than that.? Was the village totally empty just before the demolition in 1970.?? What year did you leave.?? Sorry, too many questions lol. hi. I remember the fish and chip shop. That doorway was a place to shelter waiting for a bus to school! You might be right that Mrs Lewis ran it but I am not sure. Next up from the Chip shop was the Post Office where sweets were sold – remember? I can recall Terry Lewis, I think he too went to Oz – and I saw him not many weeks ago but I have no recollection of his younger brother David. 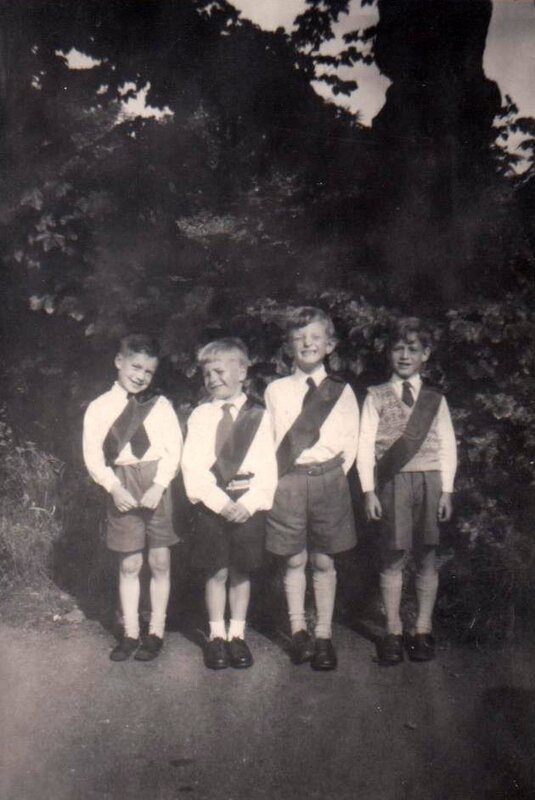 Then there were the Young brothers, Robert and David and maybe another brother too – is that right? When I was looking at the photo taken in the hut I was thinking of names and then trying to find their faces, Barbara Easter, Janice and Brian Johnson, The other Richards Joan and John ( if it is Margaret in the photo) The McGarrs, the Ditchburns, Elizabeth Kidd, Trevor Jopling, David Holmes and his cousins, Audrey and Ian Hutchinson. Sylvia Clark, The McGoverns – Joan and Eddie and Shirley. Margery and Colin Simpson, Jima nd Dennis Campbell, The Jackson girls. There were other families whose surname I cannot get, a Nigel, maybe Dowson lived in James Street, There was also another Pauline like my sister but cannot place that person clearly. The Billy Pattersons who I mentioned previously. The names come to mind but I cannot match a face to any of them. I wonder if kids from Ushaw Moor were there too. Re your question about the photo in the Loves being the Buffs – I don’t think my dad ever went to those but I guess he could have. He was a great talker and tended to tell us what he had been doing but I wont have remembered everything – much as I might want to. We moved to Esh Winning about 1961 as the family got bigger and the running down of Broompark was after that I think. Others will know for sure. The school became a heating company depot and stayed as that when all the old double rows were flattened and the new houses Cookes Wood were built. Later there was another new development between Hill View and the top end of Front Street. As Dad got older and frailer we used to take him to see the changes to the village. Its funny how one place can be a place you care about while you live somewhere else altogether. I wanted a house there a few years back, right at the very top of Front Street next to the farm but it was in an auction and it would have been tricky to get mine sold quick enough. It had belonged to Herbert Tulley. he lived in Broompark with his mother in East Street. You know, when we were kids we were not allowed to walk up Front Street because of the traffic going through and we were in real trouble if we did and got found out. I bet there were about 6 cars an hour going through back then!! Frank – If I think I have seen you in Durham I will come up and ask if its you, If its a yes that will be good. If its not hopefully they will just think ”silly bat’ ‘and walk on. Ron is right – this is making me think so much more about the place and the times. We are concentrating on Broompark when this this an Ushaw Moor blog. Hope that’s OK as the two villages are so linked by people who moved between the two for schools, shopping and later homes. I also remember the welch family and also playing up the farm. Also on occasion did the odd jobs and would be rewarded with some cakes from the house. I recall one day a heap of us kids playing on a 2 wheeled cart, might have been used when we did the annual potato pick and it got pulled by the tractor in the fields in front of Railway and Garden streets. We were running back and forth on the cart making it rock like a see saw and then it came down on someones foot causing serious injury. I noticed that the person running the Broom farm guest house is Elizabeth Welch. Patrick Neary probably wont get notification of this post because i am not getting emails either so unless he goes onto ushaw Moor facebook or wordpress he might miss it. This photo is of a hut in broompark where they had a christmas party for the kids. I believe it is in one of the huts that was on the left of the little alley way we used to go to the front street. i think it is before my time. Ah yes, Patterson was the name of the people running the pub. Earlier i made a post mentioning that i played with the son of the loves family and guessed it was john Love. So could it have been John Patterson.? My mother told me that my Dad was good friends with a jimmy Clark and i was looking at the man with the cap on at extreme right and thinking i recall his face. Still wondering if this could have been a Buffalo meeting. Can anyone verify if their Dad was a Buff.? I say – HE- because i only recall a man – but as we have previously discussed, my sister Theresa and Terance Lewis (both nicknamed -Terri/Terry ) were courting for a good year or more before we left for Australia in January 1963. I am thinking that Terry Lewis,s mam ran the fish and chips after we migrated.?? ~or – i am just not with it there.?? Patsy you did well to mention all those names. and its amazing that i had forgotten a lot of them but it all came back to me when seeing the names. Margery Simpson lived near the end of east Street and we were 2nd from the end of Albert street and we often waved to each other from our bedroom windows. She often came over and i can remember having pillow fights with her and my sister Theresa. Trying to think who the girl was that her dad was a priest.? The other Pauline you mention might be Pauline Freeman. Linda Graham mentions her in the photo i posted of Grant Street 1959. She is the dark haired girl with the doll. but Linda does say that she Thinks it might be Pauline Freeman.? Must have been later than 1961 when you left for Esh if you remember us leaving for Australia because we left Early January 1963. also Frank Clarke mentioned in one of my other posts that he never remembered me or my sister but then when i told him about my sister dating terry Lewis he then remembered Terry speaking fondly of my sister in the fish and chip shop. That photo taken out the back of number 431 Grant street was sent to me from Beamish museum and i uploaded it in high definition so you can get a nice size print from it if you save it to your computer and transfer it to a usb drive then take it in to get a photo made. Yes it was, it came to me during the night. We were still in Broompark in Nov 1963 because I think I was at the Youth Club Frank mentioned when JFK was assassinated – went home to the news. We may have moved early 1964 because we were in Esh when I did my O levels. I don’t know when the Skippers Meadows houses were built which is where Broompark people were moved to. Sorry I’m getting things mixed up a bit. I do remember the rec and how all the kids would gather there. it was best when the grass had been cut and piled up so we could jump off the swings into it. The smell of summer, cut grass. I also recall the lane up towards Bearpark near the rec. I used to walk up there with my dad, he liked checking how things were in Welsh’s fields. It was wide then but now it seems so overgrown its so narrow it looks like a footpath. We lived next to Margery Simpson in East Street. There was an older brother too but I cannot think of his name. I have seen the photo taken in Grant Street. I think it was Phoebe Richards too, and that it also shows David Holmes and Colin Agar. among the others. I’ll check it out for Pauline. Beamish have stuff on Broompark eh – well done on finding that. Hi. I think Margery did work in the prison yes although I have not seen her for years. She maybe transferred to another prison as a lot of officers do. I worked in a prison for a long time. I live near Nevilles Cross. Didn’t get very far from old Broompark did I? That is by choice, all my family are further afield but I was happy to stay near home. Kathleen Kennick said the same when we talked before Christmas. I knew it was her but didn’t think she would know me. Its hard to judge how much you yourself have changed. What made you spend your time in the village back then. Were you friends with Trevor Welsh first? And yes, nostalgic banter is good, well for me it is. Not everyone wants to go there – the past – but me, I love it. Old things are so much better than new. Frank – what misbehaviour would this be then? tell all. Its funny you mention the toilets in some of the streets in old Broompark Ron. People now would think them barbaric but its what was there in those days. We lived in a caravan when we first arrived in Broompark when I was about one year old. There were three Irish families – the Dougans, the Neary’s and us, the Fehilys and all of us had come up here for the jobs on Opencast mining and we were all parked up on Welsh’s farm. That’s how we got so friendly with him. I think it could have been a bit tricky as this was a different way of mining to what most of the men in the village worked at – the pits. But dad was good giving lifts to everyone back from the Stonebridge on a Sunday lunchtime so there was no falling out that I know of. Mind you mum used to panic when there was an election and dad would put up a Conservative poster in the window when everyone else was Labour – he said they kept opencast and therefore his work going so he was gonna support them. I only argued with my dad about politics ( well and eye make-up too ), and I still wouldn’t agree with him about that lot!! We were not in the caravans too long – we went to James Street, Dougans to Holly Park in Ushaw Moor and Neary’s later to Garden Street. Tough that you got locked up for such a minor thing – wrong place and wrong time eh but the after effects of that kind of thing can stay with a person. I do remember the name Wigham – June and John Wigham but I cannot recall faces. I also sent that photo in the hut to the other ”Broomparkers” that I mentioned but none of them know anyone. No, I was never on the Tarzan swing – wasn’t that brave or daring. We did like going down the wood to the bridge and the river/beck – my brother fell in once and I got lots of credit for pulling him out. He still says it was me who pushed him in!!! No, Beamish only had that one photo and it had a question mark next to it saying back street possibly broompark.On zooming in on it i first saw my aunty Dorothy but on seeing colin Agar with his shirt off triggered the fact that i remembered him throwing his shirt off (something he often did when excited) and putting his hand on my back because it gave me a scare. Then my uncle who was between the toilet blocks taking the photo shouted at Colin telling him to put his shirt back on telling him he would catch a death of cold and Colin burst out in laughter.My uncle had this thing about taking sneaky pictures and if you notice theres only 2 people actually looking at the camera and that is my cousin Kevin who owned the tricycle and mrs Dining who is wearing the glasses the other boy with the glasses is Brian Dining.That house is 431 Grant street and we were next one down in 432. Then when my Grandparents moved to Blackpool my grandad had aranged it so we moved into their house in Albert street. ( Think he might have bribed Mr Crossier who was the rent collector). Going from Grant street to Albert street with an upstairs bath and toilet was a luxury but i will always remember the old scrape out toilets and how they really never smelt bad because they scraped them out and then threw all that pink powder on the floor and it seemed to last until the next weeks scrape out. Also the ash bucket got emptied in there from the fire so that absorbed and covered what was in there. What a charming conversation this has turned out to be LOL. But before both these houses i was born in Gateshead hospital and our address was – Caravan Quarry grounds birtley brickworks. We were on the banks of a small stream and our toilet was a hole in the ground which was moved around and around the land near the caravan.Did you ever play on the tarzan swing at the junction? i suppose most of us did but maybe some of the girls might have been not allowed that far.I also remember a track that we went on from Relly bridge and you could end up all the way to Durham, Pinching a few nice pears from a property on the way.One thing we never see here in OZ is fresh goosberries and blackberries. Do you remember the Wigham families, there were 2 families and John who i was good friends with also lived in Albert street and his cousin George lived in George or Railway street (thinking George st). Sadly i never kept writing to John mainly because i did run into a spot of trouble here when i was caught pulling up ropes in the river which kept on snapping on the rocks.I never knew but on the other end of them ther was a net for catching crabs. They locked me up to set an example and i suppose i just lost focus on everything for a while. Will dig out my list of names that i have somewhere and add them to yours and between all of us we might be able to put the community of Broompark of our era into documentation. I remember a family that livrd right down the end in the last house in George street and their surname was Dunn. Often when we were heading down to the woods or the beck we would sing out “Mr Done Rita Dunn and he would run to open his gate yelling – i will flay you little buggers LOL. I only had little legs but could run fast. Oh- those were the days – so much less to worry about, simple things to enjoy. I am near the coop laundry and watch the school kids on their way past and think that today’s Johnson school kids are probably also doing homework on the way in. That at least has not changed. We would all have done things differently back then I suspect. I was shy – stayed that way until I was about 19 and left home. Used to wish I had more nerve, but dreaded being in trouble with mum. That was the over-riding thought – will mum find out. Ron’s memory for detail is amazing – the more prompts we get the more we remember don’t we? Where did Joe Ditchburn get to – I think he worked in Archibald’s in Durham and married that girl with the gorgeous hair from Ushaw Moor, maybe called Isabel. Or have I made that up? Frank – I will have to get that translated as I never did learn French. Will I like it. My mum was just being a mum back then, I think parents had more control over us, and what ours said was pretty much was the way it was, but mind you the mischief available to us was so much simpler than that available to teenagers now. And better for it!!! I’m happy with how life has treated me – I liked work, I love retirement, I like where I live as I have all I need nearby. I spend my time doing what I want to do, busy days or lazy days. Maybe I should learn French. thats quite a review you give me after a few emails and a time lapse of 50 years. I do have a few clouds on my landscape – they will all be in the book!!. I did translate as you guessed — well, what can I say? On the subject of nostalgia, which we were a few emails ago, the thing that also recently took me back to the 50/60’s, apart from talk of Broompark and my Motown c.d. on for the drive to Lincoln today, was watching the dvd of Lonesome Dove – anyone seen it? The book is brilliant but having it on screen was wonderful – took me back to watching Wagon Train and Rawhide as kids. Loved it! Interesting Patsy that you moved to Broompark but lived in a caravan on Welshes farm. My grandad and grandma moved there and lived in a caravan also on a property on the hill just before Relly bridge. I am thinking that that was Rellys farm. I have also made earlier comments about this. They also moved to the area because my grandad had work at the open cast as he was a good operator of navies (now called excavators) and cranes, bulldozers etc. Not sure where the open cast was but thinking maybe Brandon. My Grandparents had me on many occasions as a toddler and i recall Grandad had a horse called Dobbie and a cart and he did pick ups and deliveries all over the place around that area but somehow often ended up at the Stonebridge pub and i was just a toddler but had to drive the horse and cart home. Such a big feat ~ he would tie the reins loose and yell ~ Home Dobby and he just went home. I did leave a comment on the stonebridge facebook site. No wonder you remember us leaving for OZ, the taxis must have been lined up right by your gate in East street. The broompark hut photo could be as early as the 1940,s.?? The history , and the 2 photos i found with the help of others of the mine before and after the fire was quite mind blowing especially discovering that the coal mine was built in an area that had a mysterious medieval moat. Can only think that the moat was built when the Scotts along with their Irish armies attacked Britain and Durham Castle was a strong point so they may have had to build some sort of moat barrier themselves for protection.??? Originally i think from county Cork. By the way, Might have been ME that pushed Brian into the Beck lol (i did it on many occasion) But the only time i can remember the beck being deep enough to drown was when we all got together and damed it to make a deep pool.?? It was December 2012 i left my comment on the Stonebridge page. The Stonebridge played a big part in our lives too. Dad would pile us in the car to go out ‘for a spin’, usually up to Wolsingham or Stanhope, and we would end up at Stonebridge, us with lemonade and crisps while he had a pint, mum probably had a shandy. My best memory is of being taken there when quite young to choose a puppy, a chow, as Ivy and Foster Walton, who ran the pub then, had a litter to get rid of. I chose Suki as he had fur the same red colour as our mum’s hair. A lovely quiet dog we had for a long time. They went to live in Germany. The lady next door to us in James Street, a Mrs Hall, suggested the name. I can think of a few others who lived in street, not all, but I only have one name for neighbours in East Street and that was Mrs Twist and her daughter Barbara who had rich red hair. We looked out to where the pit had been but we always referred to it as the Screens. The opencast at Broompark was the long field of Welsh’s below the house and St. Catherines Church. Dad later dug up topsoil at New Brancepeth towards Pit House, Page Bank near Spennymoor, Wylam and Heddon on the Wall – these last two much further away from home. Hard work with 12 hour shifts and then the drive back. I just got a copy of a very old map of Durham and there is a moat shown on that, near Stonbridge. Its a bit baffling as to why it was needed there but yeh I guess hostilities dictated actions. And as for your Irish family, well funnily enough my dad also came here from Cork, West Cork, the road out West from Cork to Bandon and then Enniskeane. I’ve been there and loved the place. One day, if I win the lottery (or even do it) I would buy a place in southern Ireland. Its a shame there were no familiar faces for you yesterday Frank. I did slightly better today. I have seen a man at church who I knew lived in Broompark but I had never spoken to him before, today I did mention the village. He is Colin Wilde. his wife was Stella and his daughter is Lynne, they also had a son but I dont know his name. 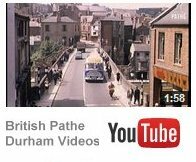 They lived in George Street, moved to Esh Winning and then into Durham. Sadly Stella died three years ago. Colin remembers you Ron and your family moving to Australia – I told him about the blog and said I would tell you he could recall the Nightingale family. I also mentioned this site to my brother Bryan ( living in Lincoln now) and how I had mentioned him to you. I thought it best to tell him I’d posted a childhood photo of him here. He asked where you were but my geography of Australia is not great – is it near Perth? I’m trying to get more people to have a look and maybe come up with more photos..
Keep looking for the ‘old’ faces in town Frank – maybe next weekend!! Frank – I really do hope that next Saturday you get to see someone to go over old Broompark times with. Good luck. I used to live in one of the houses just down from the Stonebridge Inn, towards the dairy. I walked past the chow chow every day on my way to Neville’s Cross School and it ran and bit me once. I think it was called Brandy. This was during the early 60’s! 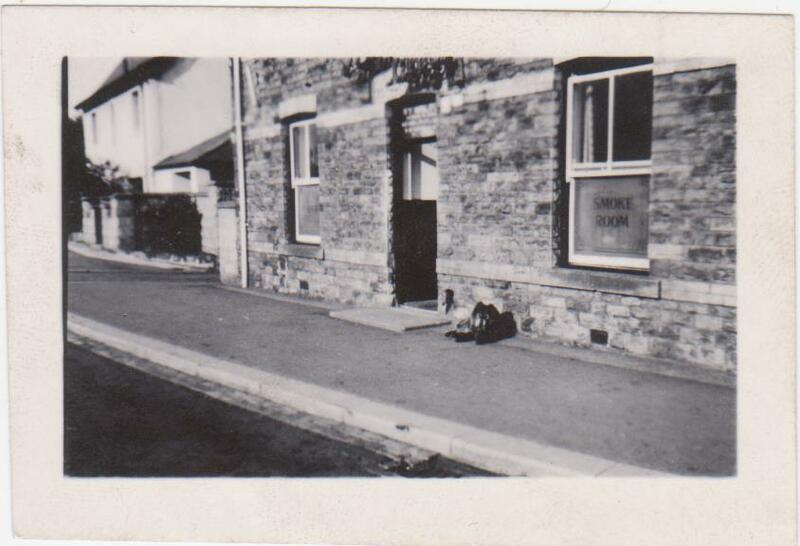 if you look on the Broompark Memories blog you will find a photo of a chow outside the Stonebridge Inn taken back in the 50’s probably. Don’t know the dogs name or if it was the one that chased and bit you but our Suki came from a litter of the dogs that belonged to Ivy and Foster Walton who ran the pub then. I know the houses near the (then) diary that you refer to, they were developed a few years back after standing empty for a long while I think. They were always good looking houses- you will of course know this if you still live locally. The sites re Ushaw Moor and Broompark are great, it would be good to have your input. Great to find this site! The surname wilde rings a bell. But are you saying Colin was married to a Stella at broompark.?? I live in a place called Mandurah, just south of Perth on the Coast. Frank, you would probably run into Broomparkers if you were strolling around Ushaw Moor asit seems like many moved there. hello again Ron and Frank. I think Colin and Stella got a house in Broompark when they married. I don’t think either of them were from Broompark before that, though I may be wrong. Seems like your family were drawn to the same part of Australia as mine were. Was there a choice I wonder? I went through Broompark earlier this week – its awful seeing the Loves all kinda ,,”sealed up” with the curtains all drawn and no sign of life, So many pubs are closed now – though the Duke of Wellington seems to thrive and the Flass in Ushaw Moor is still open – I think! here is a link to a Northern Echo article which includes a good photo of the Loves – in better days. I guess this might have been on the site already – you’ll let me know. We are still stumped by the photo taken in The Hut. I remember going to things held there, a man showing films and jumble sales. The man who was caretaker lived in one of the two houses near to it, the other side to the school. I think his name was Peter Wilson – was he a bit scary? No new/old faces spotted – will keep looking. well I checked out the ‘faces’in town on Saturday last but saw no-one I knew. I guess its like everything – when you want something to happen it doesn’t, then it will when you are least expecting it. That said, I did see a I face from Broompark on Saturday evening but I did not follow up on my plan to ask if I was right. It was a lady who lived in James Street when we did, I think the end house but she was a mum when we lived there so she probably could not be bothered with someone asking her questions about so long ago – I decided it best to leave it. Ron – Mrs Dougan has confirmed that it is Pat Neary drinking his pint in the Loves photo, she told me everyone called him Blondie. The families knew each other so well I am sure that is right. She also confirmed the opencast at Broompark was the field behind the farmhouse but further over towards Bearpark. I have some photos of us all taken near those fields , and some in the farms front garden but they are really just people, not the village as such – could be anywhere really. Its a pity Pat Neary in Dublin has not been back to us – he might have liked to see the photo. Hi Patsy, The link to the hut was given to me by someone on the ushaw moor memories site as was the photos of the colliery at Broompark before it burnt down and when it was on fire. Also the old ariel photo taken in 1945. But when i first started googling for Broompark i did come across that hut photo myself and someone had mentioned a couple of names as she recognised her mother. I havent been able to find that post since. I copied the article from the northern echo and i might have posted it on the site but never noticed the photos. Seems like you might be finding the same articles in your searches which is understandable as there seems to be very little out there on Broompark. I was also trying to find out what company had the demolishing contract as i think surely there would have been photos taken. I think i recall a caretaker that told us off if we climbed into the school yard to play on weekends and i also think he had stuff in one of those huts. Still wonder if the Loves had photos hung on the walls. also the old farm which is now a guest house.? I too was in Durham but only briefly, it was too cold – and they promised us sun didn’t they? I also looked out again for a face without seeing any I knew. Doing this gets the better of you though and you forget what you are there for. Maybe standing still will be a more successful option. as for the eyes – not sure how to assess sparkle. Links to other broompark photos in the comments by Ron Kitchener. Sorry, Ronald Kitching – not Kitchener. Ron I do remember some things about the houses you mention but Frank might be able to add more, he was around Broompark longer than me. The very end house – a lad called Keith Smith lived there, maybe with his mum. I don’t know anything about him and am not even sure if he was friendly with the other lads in the village. The house next door to that was very big, double fronted with a large walled garden. I think the door was on the corner, set at an angle as if it has once been a shop – though never in my time. When we lived in East Street I don’t think anyone lived there, it seemed quite neglected but I liked the look of it ( the navvy in me wanted to get inside). However, after we left the village it was bought by two brothers and they split it into two for their families. The family name was Graham and I know one of the girls, Sylvia. She has a couple of sisters and a brother too I think. I still see her occasionally and she liked living there. Sylvia is one of the group of us I mentioned who called it a meeting of the Broomparker’s when we met for a drink. Now it is back to being just one house belonging to one member of that family and it is lovely, really smart with lovely windows/shutters etc. I expect the garden is good too, it is bound to be to match the rest. You may be right that it was linked to when there was a colliery with no doubt a manager – that’s how they did things back then wasn’t it? The Dougans – you might remember Graham, he was a bit older than me, very very blond hair too but they moved to Ushaw Moor when he was about 5. As we all lived on the Farm at one time the lot of us all played together – Trevor Welsh, Graham Dougan, me and sometimes Ian Barrass too. I have photos of us in the garden – then Alan Welsh, my brother Bryan, Kevin Dougan and Pat Neary all came along. The three Irish families tended to stick together so Neary/Dougan/Fehily would be grouped together when either one was mentioned. I am loving this looking back and remembering those times – its funny as I cannot always recall what I did last week!!!!!! Patsy you mention mrs Dougan.?? I remember that name also. I remember Pat Neary but not that well, only that he seemed a tall man with blonde hair so i was looking at the other taller man with blonde hair. I dont know why we havent heard back from Pat junr. maybe he is holidaying somewhere.? Is there any history on the 2 big houses still standing on the right as you leave Broompark towards stone bridge. I always wondered if they originally housed someone important.? Maybe the coal mine owners or managers.? I had forgotten the name Keith Smith but remembered as soon as i saw it. he was not a nice person and i could tell some stories about him but will let sleeping dogs lie. The house next door with the high walled back garden had a very large old cherry tree in it and i used to get in there and climb the tree to get the cherries. My grandad ran the allotments which was the one right next to those houses and backed on to the main road and all the way down to the colliery grounds. My Dad took it over when Grandad moved and bought a bed and breakfast house in Lancashire Road in Blackpool. We ran the egg shed and grains and feed which was just near the Smiths back gate. There was another younger woman who i think was his sister but older than Keith and often she would be staring out of the window of the vacant house when i was picking the cherries so i wondered whether there might have been an adjoining door between the 2 houses. She never came out of the house and i think she was maybe not quite with it. You could turn into the village down a dirt track near the houses and that track led right down to the path that led all the way down to the beck. If i ever get over there i would probably just enjoy a walk down that path to the beck. The track you mentioned up near the rec grounds that is now grown over is one i remember walking right through to the other road and there was another farm that had orange juice ?? ?.But i do remember the cows were let out of a gate there and they walked all the way down the road to the farm for milking. I remember the tree in the big garden, don’t recall seeing you climb it though. My dad had a big allotment down there, grew nothing but potatoes. Well we were Irish and we had to be ready for another famine I guess. Dad loved a laugh and would do things he shouldn’t, just to see us cringe with embarrassment I think. We did have some chickens so he must have got the feed from you. The track you mention went along the front of East Street, down the end of Albert, George and Railway Street, down to the bridge over the railway line and down the steep path to the beck. I bet its all blue bells down there soon, it used to be lovely to see them. I am not sure if you can get down there now that Cookes Wood has been built. I should check it out, might start with Google Earth. I dont remember getting orange juice from a farm ( that must have been the Bearpark road ) but I do recall when Welsh’s brought their cows back to the byre for milking, driving them down the main street, and then back up to which ever field they were in, and the traffic just waited – not sure they would now. They used to just take their time, I think maybe Billy Harrison did it more than Billy Welsh but it was the only way – funny and quaint now isn’t it? me again. Just looked at Broompark and the track seems to now be a tarmac road, reasonably wide to the extent of the houses and then narrower beyond that to the Walkway – or what was the railway line. The path down to the beck is partially covered by trees but its still there.We used to walk that way with Hutchinsons, our next door neighbours in James Street, over to Saco’s Ice cream parlour in Langley Moor. It was gorgeous ice cream, pure white. Do you remember Audrey Hutchinson – she had a younger brother Ian – they moved to Redcar before you left I think. I remember your dad being a joker. my dad also loved a laugh and was always pulling your leg about something. We had 3 big chicken sheds on our allotments and about 100 chickens. a van used to come from somewhere (maybe Durham) to collect the eggs from the egg shed which were already stacked in their cartons and had been sized.we also grew many types of vegetables and had an abundance of chicken manure Dad often won prizes at the Durham show mainly for his big leeks he grew. I also checked using Google earth and noticed that the track to the beck seemed to be still in use. I suppose it will also be a nice walk for the residents of the new estate. Do you remember the piggery.? It was the only allotment on the right at the very start of the track. A boy called Micheal (Mick) Saunders used to work in there. The fields on the right after the piggery which went all the way down to near the railway bridge was had a couple of Shetland ponies in there and one of them would chase you if you climbed through the fence and into the field.The top strand of wire was an electric fence and often we would join hands and let the shock run through us and hopefully have a bit of fun by touching one of the girls to give them a shock. I still bear a scar on my head from when the pony chased me and i dived through the fence and the barbed wire ripped across my scalp. I do remember the name Audrey Hutchinson. i am thinking it might have been a friend of my sister. Theresa also had another friend in James street which i am thinking might have been called Joan McGovern??. Did you get involved in the pototoe picking in those fields when we made up teams and picked potatoes behind the tractors. We were also always walking on weekends and across the beck and up the path to the road and down to Langley and often went all the way to stone bridge and back up to Broompark. i recall that path on the bank over the beck being very steep and wonder if i could do it today without taking a rest on the way lol. Also in the field on the right of that path there were a few holly trees and we would pick holly in the winter time. The other thing i recall is when heading towards the beck and just after crossing the railway bridge we went to the left and there was an area not far from the bridge which had an abundance of black berries and we took buckets and my Grandad made made a superb blackberry and ginger wine which he had in a big barrel in the pantry. Great memories. And funny how the memories keep coming because i think i can remember walking out our back gate in Albert street and along the path at the front of east street and knocking on the door to see if one of my friends could come out to play and i am thinking it was only about 3 houses up so it was probably your house and i was looking for Brian.? Great getting these memories re- ignited. The track you speak of in indeed still there. In fact there is a little opening at the bottom of Cookes Wood estate to join to it. Its pretty rocky and i think as well as walkers, used for access to the house at the bottom of the valley below Broom Park. I live in Ushaw Moor and walk along the ‘lines’ and back up that way to join the main road. Hi matt You say there is a house at the bottom of the valley ? do you mean down near the beck.? i wonder how someone got permission to build a house down there and when it was built.? Would love to see photos of that. Ha Ha, Matt you are taking me for a lend. we did live near the end of East Street and I cannot recall any other young lads living there, I think most were elderly people so am guessing you probably were coming for Bryan. You must have been in the same class as him in school. Audrey Hutchinson was younger than me and I am not sure if she was friendly with your Terri. The girl called McGovern near the end of James Street was Olive McGovern who was related to Joan. Her family lived in Garden Street, there is a brother Eddie and I think a younger sister Shirley. Our Bryan used to ‘play’ with Eddie too so I bet you did as well. I take it you too have looked to Google Earth to check out the old place and the new pathways. There does seem to be something going on over the former railway line but I took them to be allotments, maybe its a house, with lots of room to grow things. There does seem to be a house among the trees too. Wish there was more on when Broompark was demolished. They came up with this list of Category D villages where no money would be spent on the houses and that was the beginning of the end of it as we knew it. I moved into Durham to my bed-sit when I was 19 but went every week without fail to see Mum, Dad brothers and sisters in Esh Winning. And I went on the bus. I have no recollection of going through Broompark and seeing the changes – must have blocked it out as too painful eh!! Mind you when Dad used to take me out for driving lessons we would go into Durham that way from Esh and he would always tell me to speed up and not look like a learner in case someone who knew him saw us. Funny really cos years later I was stopped by the Police for speeding ……..in Broompark. Thanks Dad. well I was also in Durham last weekend but I did see a face from Broompark Youth Club days, one I think you will remember. I saw Ella Curry in a shop. Needless to say I did not dare say hello, losing my nerve in case she thought I was some nut, but I am sure it was her. I shall be down there again this weekend, late morning. I shall check out the buskers on the bridge. Will you be singing a John Leyton song – if you are then there will be no way I wont recognise you will there? well how can I possibly miss you this weekend. 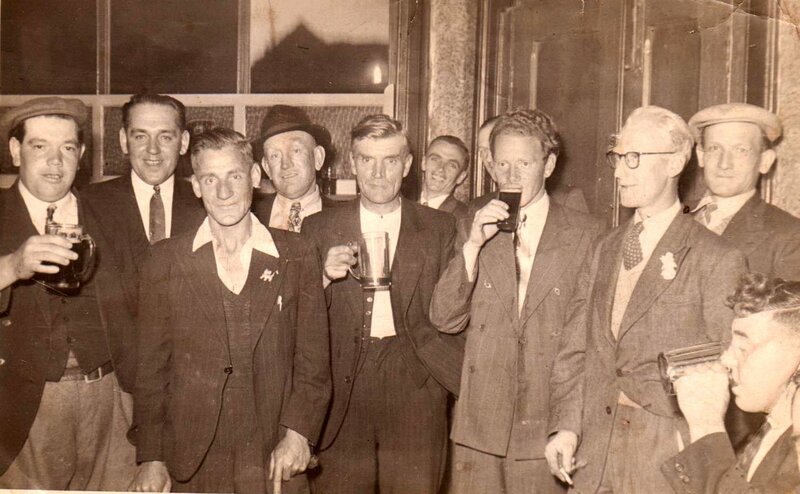 in the Loves looks like Jim Clark on the right with flat cap, and that looks like my dad Jim McGarr sitting on the right drinking a pint. My guess is this photo is about 1957/58.Pat Neary jnr said he thinks they left broompark when he was about 5 or 6. He was born in 1952. My mother also told me my dad was good friends with a Jimmy Clark. I also seem to remember his face and think he sometimes called around our house and him and dad went off somewhere.? Sheila clark i think was about my age and her dad was maybe around my dads age. My dad was 29 when i was born in 1950 so that would make him around 36 at the time of this photo. Stephen Hancock -Comment number # 15 here states that his Mother Sheila identifies jim as her Dad. She also identifies others. I could be wrong but either way it is great to see people identifying faces and bringing the past back to life. The name McGarr keeps ringing a bell in Broompark.? Did they live at the top end of Albert street. Did do a check with google maps and Google earth and it does seem there are buildings down in the valley that were never there in the early 60,s. I should imagine also that now the rail lines are used for trekking they would have to put toilets here and there or they would have to do what we did which was sneak off to the side and hope to find some big leaves.LOL. It was really good to catch up as we did. I was smiling for the rest of the day. I hope you get to see another familiar face again soon. The Great Escape was on again today – they still didnt get away. I am watching Get Carter now- this sure takes you back to a different North East. I am trying to remember the name of a friend i had in broompark and i thought it was a barry Mcgarr.?? He was in the merchant navy or the navy and his ship was in the port of Fremantle around 1964/65 and he came to visit me when i was in a boys home. I am thinking he lived in about the 3rd house down in Albert street at the end nearest james street. From memory his dad was a stocky man but was often seen having a coughing fit at the gate and i am thinking he died of a lung problem which would have been around 1960. Strange how the memory works or- doesnt. Perhaps it will come to me soon. hi Ron. your message about the need for big leaves did make me smile–hope you didn’t grab any nettles!! I remember the McGarrs, I think Marie was about my age. Peter says they lived at 389 James Street – we lived at 386 so they were just up from us but I can only think of them in Albert street, opposite the store. I will mention the McGarr’s to my brother Bryan next time I talk to him. Can anyone remember the air raid shelters that were there between the store and the school. Dark dirty places but very tempting to get inside and look, though only if someone else went first in my case. I did ask about that little building earlier next to the co-op store on the main street side, or James st end. I recall we would sit on the steps sometimes at night and share a fag as it was a great vantage point being close to the top of the main street and able to see anyone walking up from one of the other streets as it was totally in darkness on those little steps. I recall we walked between that smaller building and the store to go to the air raid shelters. The one on the left was the one mostly accessed because the other was more blocked off with old bricks and rubble, as was the left one but not as bad and we had to watch our footing as we entered as we had to lower ourselves down onto a pile of bricks and carefully get dow to the base where it had been cleared and most the bricks moved to the sides. I suppose at one time the parents had tried to block access totally for safety reasons but failed due to lack of fill. Also wondering now where all those bricks and ruble came from and thinking it may have been buildings destroyed by the 1904 fire from the colliery. We used matches and candles to light the place up and when you ventured up toward the far end it was not unusual to see that someone had done a crap up there and left a pile of paper on top of it. I think it was kids visiting from other places like Ushaw – Brandon that used them for that as they didnt have many places to go, although – kids are kids and we went when nature called.. wondering if my talk about looking for large leaves jolted Patsys mind about the air raid shelters,ha ha.eter it must have been Jim that visited me in Australia. You mention your other sister and brother but not Jim in your earlier post #72. Thank you Frank, there was no need but thank you, lovely. Hi Ron it’s me JImmy I have been reading your banter and memories for quite a while now it has been very interesting. I sent you a E Mail some months ago to your web site , never got a reply, is the site still open? never got a reply, is the site still open? Hi jimmy, good to hear from you. Which web site are you talking about.?? I did have a play around at setting up a site a few years back using a free web host which i think might have been -freewebs. ?I was promoting my ironwork but gave up on it. Are you sure it was my site because i thought i named it ~Total Forgery. I only have a facebook account and now since being here opened a wordpress and also twitter account. Well, i have quite a few accounts like Youtube etc but no personal website so if you can remember the site or how you found it i will try to close it. I dont know why i could not reply to your post.? it only had the option to quote. Making this thread even longer ? ~I think Patsy Hopkins takes the cake so far for the longest thread as this makes it #91. 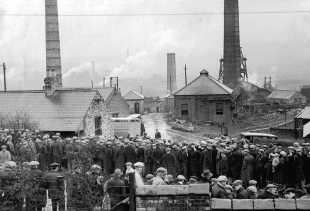 When i first started looking for info on Broompark i found next to nothing other than info on the old colliery which was all new to me as i dont recall any stories getting around about the place burning down. What i want to do now is get all the broompark info and photos in one place which could be a mamoth task as i think i alone have quite a few posts. Hope you are enjoying the retired life, I turn 65 next March so will also be in the same club, although i havent worked for about 3 years now and get a disability pension due to both shoulders being operated on with one not repairing as it should. But i am able to do most things but with caution. Hi Ron, you lived down the bottom of Albert st, we lived 354 next door to the Ditchburn’s the end house was the Brennan’s, opposite was the store,in grey brick, to the left of that was a older little shop which was in red, I think the brick building replaced the red painted one,. Behind these was the two air raid shelters which we played in. I think we moved to ALBERT St when I was about 6 or 7. I use to play with Terry Kennick. My brother Jim did go into the merchant navy. Hi Ron, do you remember the “Tarzan Swing” under the viaduct down near the junction, looking back its a wonder no one was killed, health & safety would have a fit if they had things like that now. Do you remember the midden men who emptied the toilets ( earth closet) what a job they had, shoveling it out on a Monday morning, stopping for a cup of tea & a sandwich, not even washing their hands, the good old days. They use to throw a shovel full of what looked like pink powder into the “thunder box” us kids thought it was rat poison, I think it was disinfectant.. Standing out side the Loves we use to follow the trail of the farmer Davy Shanks, he use to use chewing tobacco, spit every few yards. I remember the tarzan swing well peter and have mentioned it on my other posts. It was on the banks near the railway houses at the junction and Brian Grimes put it up.You could see the viaduct from the swing. I mastered swinging and grabbing hold of a branch of the opposite trees and recal on one occassion i climbed onto that branch and was stuck up there as i lost the rope and it took forever to get someone to swing out there to rescue me. I also mention about the pink powder that seemed to last all the way to the next scrape out and we also threw our ashes from the fire which helped absorb some of the smell i suppose. We started in Grant street at number 432 and then moved into Albert street with the upstairs flushing toilet and a bath which was a blessing. So it must have been Jim that visited me in Australia when he was in the merchant navy. How is Jimmy doing now.?? I seem to recall someone leaving a discusting trail of spit but the name Davy shanks. Was he from the other farm.? hi Ron. yes Davey Shanks ran the middle farm, or thats what we called it. The top farm was Jack Kidds wasn’t it? And the other one Welsh’s of course. I have to ask what this Ball Alley was. Sheila ( Hudspith ) talks about it as if I should know but I really have no recollection of the place. Was is behind the Loves. My recollection is of buildings there, part of the pub building, all covering what is now the rear car park. I too can remember going to see films in the Hut, and doing handstands against the walls with Audrey Hutchinson!! and yes, the shelters were disgusting – probably why we were all told to stay away – didn’t work did it? The Ball Alley was at the rear of the Loves, it was a walled enclosure with what seemed to us kids a huge wall at the pub end. Some one once explained the game that was played but that’s lost in the mists of time. I know it was full of rabbits…My brother Jim retired last year, he is doing canny he lives at Brandon. There were lots of characters lived there, Jimmy Hewit with his motor bike, Frankie Miller, I think he lived with the Kennicks, I remember the doctor had a sort of clinic in the end house in the last ( cant remember the st, name) house, opposite the little chapel you had to write your name on the slate on the wall.Patrick Neary lived in that street. I did get to play in that back area with the patterson lad . Yes there were lots of rabbits and also a garden where they grew vegetables and fruit. There were 2 big wooden doors which opened that back area but i never saw them opened. Possibly for storing horse and carts in a secure area in earlier times before cars when travelers would need a rest up and a bed for the night.? Patrick neary has commented on this post. Hi Frank, is there any way you can post a copy of those maps.? I couldnt find any at all of the old village. I remember a kid that had Rooks and Ravens in a shed or cree right down the end of brandon view. Might have even been behind the post office.? I reckon it was that photo taken in the Loves. But then there is so much to say about Broompark and the people isn’t there? I hope someone can set up a site that’s all about Broompark, though it wont be me – way way too technical. I have actually set up a BLOG dedicated to memories of Broompark. I guess u missed the email to join. I added some content from Ushaw BLOG. Mainly rons posts… And a few NEW ones. From now on if you want to post new content regarding Broompark please use NEW blog. Also setup a Facebook group and Twitter which are connected to blog. Thanks Paul – I had missed the email, but then I saw it. thanks for doing the work to set it up. Ron Nightingale seems to have an amazing memory for detail so hopefully his posts will encourage people to write. I am going to try and spread the word too. Then CLICK on MAP on area U WANT, u will then see a list of Thumbnails down right, click on ONE. What year are u looking for ? 1970 and pre- 70 for broompark seeing as rt was demolished in that year. But isnt it easier to simply copy and paste the URL link so we can just click on it.? How about we work on getting the broompark info all in one area.?? Is it possible or too hard.? Don’t think those maps I used go to those years. I will sort when next at pc. It is looking like b park could do with its own blog. I will look into it. Would u want a seperate blog or just sub section. Not sure what would work best. Just thought that if someone in the future was googling Broompark it might be good to have a photo gallery so they see all photos. At the moment the blogs seem scattered but thats mainly my fault for starting multiple threads. Unless they know to scroll up on this page to the cloud tag for Broompark they might be missing the other posts.? The other annoyance with wordpress is we can not post a photo – only a link to a photo and if we have to use a photo host site like IMG or flicker etc there is no garauntee that one of those sites might go down in the future. I have thought about a Facebook like Ushaw memories has. Not sure how secure wordpress is in comparison to facebook.? Hi Ron, I had thought of having Broompark stuff separate as we seem to have quite a lot of Broompark related info. I could create a PAGE on the BLOG similar to what u see ABOUT and MEMORIES FROM THE WEB, but doesn’t work the same as the rest of the blog, and any user would have to click HERE to add related info. But this works differently to rest of the BLOG, really the BLOG is not meant to be like a website more like an ONLINE DIARY. Then I would have to manually move all the related stuff over to the PAGE. To me a better way would be to create a NEW BLOG dedicated to Broompark, of course we still need to get the data over to the NEW BLOG, which is still tricky, their is a backup feature which is designed to BACKUP ALL data from one BLOG to another, the only way could selectively do it is either by hand which would take forever or ou can back up by AUTHOR eg yourself, but that wouldn’t get all the related DATA. YOU can add photos to a NEW POST simply upload them, you can also add photos to comments, but like u say you have to have them stored externally. Also as an AUTHOR, or EDITOR you can enter PHOTOS directly into COMMENTS you make using the BB CODE. You can of course create it on Facebook may be easier to setup, maybe a GROUP the good things with groups is that each member get notified whenever a NEW post is made, unlike Facebook PAGES where it’s a bit hit and miss if the FAN sees the update. Chief Administration Officer. What is the minimum wage in Australia Ron? If your asking what is the minimum wage for a chief admin officer~i wouldn’t have a clue. That would be a position in a big company that has a lot of admin. I would say it would be up to the company to offer the salary package and I would guess a mining company package would be much higher than the likes of Woolworths etc.